The 93M paper folder is a compact desktop manual paper and letter folder designed for ease of use. 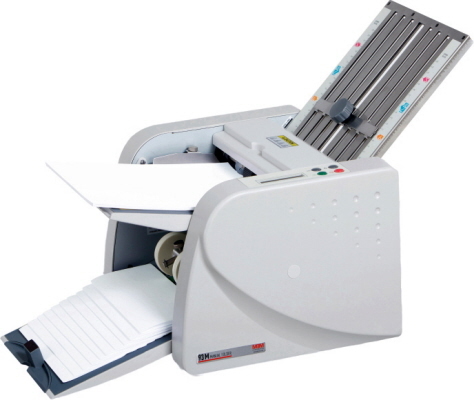 The ideal MBM 93M has simple push button operation and easy to configure fold types for colour coded standard and custom folding formats. The exit tray conveyor system is unmatched in the market with this class of folding equipment. The finished product is stacked neatly into a sequential order for numbered jobs. Once the final paper sheet has exited, the unit automatically stops. Maximum paper size - 8.5"x14"
Easy set-up for standard and custom folds including single/half, letter, zigzag, double-parallel, fold-out, gate and more.